What Is Process Control Engineering? Process control engineering is the design of electronic controllers that allow chemical processes to be automated, or run with little human control. Chemical processes are complex systems with a wide range of reaction, purification and final product handling steps. Since the development of computer systems in the 20th century, chemical plants can operate increasingly complex reactions to provide chemicals used in consumer and commercial products, often with little human intervention or attention. Controlling a chemical process can involve a simple act such as opening or closing a valve, or complex control systems that react to changing conditions with many different responses. This can be accomplished because many new controllers since the late 20th century are programmable controllers. A process control engineering technician can enter computer program instructions that allow the controller to react differently depending on the conditions. For example, a change in temperature might be corrected with a change in raw material flow, or cooling water might be started on the reaction vessel. 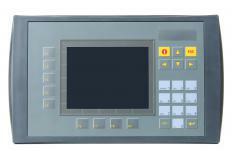 The program used in these controllers can compare actual operating conditions to a normal state entered by the technician. As conditions change, the program compares the changes to a series of programmed responses to correct the change or deviation. Programmable controllers are a key part of a process control engineering design, but they also must allow human intervention. This is normally accomplished by a remote control readout in a central control room, which is monitored by human operators. Process control links the controllers to a wide range of sensors to monitor temperatures, pressures and flow rates. Complex chemical plants may have thousands of sensors connected to hundreds of system controllers. Along with the remote control available in a central control room, most systems include alarm functions to give an alarm that can be seen and heard. These alarms are set to give a warning condition when the system conditions deviate or move away from normal by a predetermined amount. Alarm functions can provide a wide range of warnings in a complex process control engineering system. A first level of alarm may be an alert to warn the control room operator that a system condition is moving away from normal. In many cases, the programmable controllers will make corrections, and plant operators do not need to take further action. A second level of alarm might be programmed if the controllers are not able to correct the changing condition based on their programming, and the operator may need to get involved. Controllers have buttons or dials that will allow the operator to enter a different operating condition, and confirm that the controller is making the correct change. Most process control engineering designs for control rooms include a visible diagram or schematic of the process, with major operating conditions and alarm points on the diagram. An operator can quickly see where in the process the deviation is occurring, rather than having to scan numerous dials or gauges. Additional alarm conditions may be required for processes that handle hazardous chemicals. If a leak occurs or a tank overflows, sensors can be placed in key areas that will detect the chemical release and issue an alarm. This may be a local alarm at the control room, which will cause operators to take safety precautions and go outside to find the leak. Sensors may also detect leaks outside the immediate plant area, or along the company boundary fence, to warn operators and others in the plant vicinity that a release has occurred. The controls, sensors, and alarms are connected and work together to manage a wide range of chemical operations in a process control engineering design. What Are the Different Types of Chemical Process Control? What Is Process Control Monitoring? What Is Process Control Design?